Jeff checking in from the Eldorado out of Long Beach Sportfishing fishing San Nick. The guys are happy heading in with limits of lingcod to close to limits on the rockfish and more. Jeff is live below to tell you all about it. 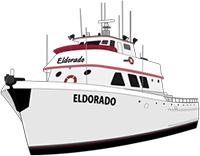 The Eldorado is a go for Monday with trips all month long.